Spring is seed season—and a good time to think about gifting seeds to gardeners, friends, and green-thumbed moms (think Mother’s Day, May 8). 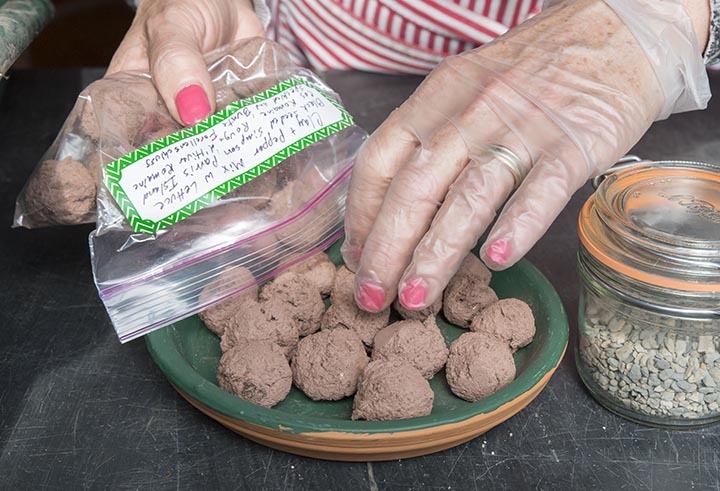 Musing about how to share some of the seeds that she gathered at February’s Seed Swap, horticulturist Nancy Clifton got interested in the guerrilla gardening-inspired idea of “seed balls” (or seed bombs, as they’re sometimes called). While the guerrilla gardening movement leans toward stealth seeding, Nancy thinks seed balls make an ideal gift item—they’re easy to make, easy to “plant,” and an easy way to teach kids about germination. Clay powder gives seed balls a reddish color and even texture; using clay chips makes a slightly chunkier, greenish seed ball. Both work equally well. Mix the dry ingredients; then add ½ cup water. Stir, then begin to judge the consistency. Wearing gardening or plastic gloves, roll a teaspoon-sized ball in your hands (size can vary). Think “mud pie”—the ball should hold together when you squeeze it, without crumbling or dripping water. Roll all of the mixture into balls; then let the balls dry on newspaper or waxed paper for two or three days. Don’t worry about smoothness—rustic-looking seed balls are as interesting as marble-smooth. The color will change to dark red/terra cotta as the balls dry. This recipe yields about 24 seed balls. Less is more. You only want a few seeds to sprout from each seed ball. Too many seeds mean too many sprouts, resulting in too much competition for nutrients and water. Use organic, non-treated seeds from your own garden or from trusted sources. Choose native species for flowers and perennials that will grow successfully in our USDA Zone 5 region. Be responsible: do not use seeds from invasive species. Wear plastic or latex gloves when making seed balls. The mixture tends to be very sticky, and clay can dry out your hands very easily. Seed balls can be set into a container of potting soil (sink it down just a bit into the soil), or placed, randomly or intentionally, on bare soil in the garden. A rainy day is the perfect day to “plant” seed balls—rain helps to break down the clay and compost, giving seeds a good dose of food and water to get started growing. Throw one in your garden. Fill an empty space. Gift a brown- or green-thumbed friend. And happy spring, everyone!